Imagine you are reading your school textbook, or maybe your favourite novel, and suddenly, you need to put it down because of some urgent matters. When you get back to your reading, you can no longer find the page where you stopped. What are you going to do? How will you prevent this to happen again in the future? The answer is simple—bookmark. Bookmarks help you keep your place in a book and enable you to easily return to it with ease. While we commonly know the traditional paper bookmarks, there are other materials that can be used as a bookmark, such as leather, plastic, silver, brass, wood, and cord. In this article, presented are different awesome templates and examples of bookmark that you can refer to. 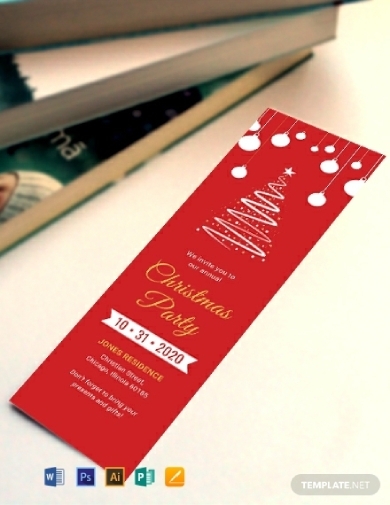 Get this holiday-themed bookmark template that is easily customizable according to your specific preferences. This can be for personal use or you may opt to send this as a simple gift during the Christmas season. It can easily be edited using various computer applications that can open Illustration, Photoshop, MS Word, Publisher, and Apple Pages file formats. Because it can easily be edited, you are free to incorporate your desired text, and you can freely drag around the elements until you get satisfied with the presentation. Planning to send save-the-date invitations for your upcoming wedding? Aside from the regular card, you may also opt to give your invitees this save-the-date bookmark, which serves as both an invitation and a bookmark. This template is fully editable. Hence, you can change the date, names, and important details. You can include the specific location of the wedding ceremony as well as the reception. Note that this is just to inform the recipient regarding the date of the upcoming wedding and is sent prior to the invitation proper. Need other ways to send your thanks apart from thank-you cards? 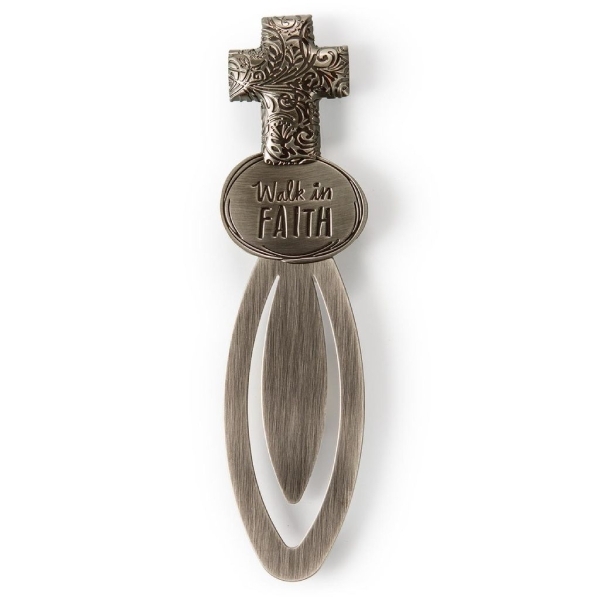 With this thank-you bookmark, you can creatively express your gratitude to your recipient. When sending a thank-you note through a card or a bookmark, it is better to personalize them so that the recipient would feel that he or she is indeed special. You can do this by editing this template on any program that is able to open Illustrator, Photoshop, MS Word, Publisher, or Apple Pages. It is not only convenient to edit but also convenient to print and use for any size of books may it be the standard book size or the digest size. Getting bored with traditional wedding cards? 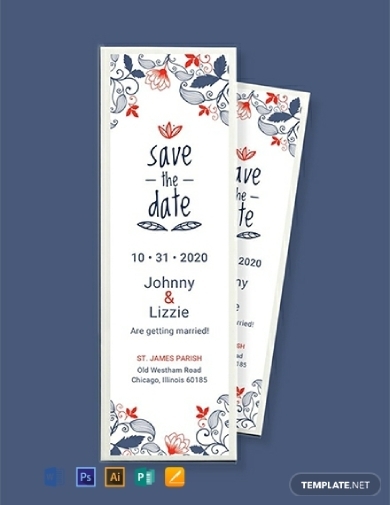 Express your artsy ideas with this fully customizable wedding bookmark. 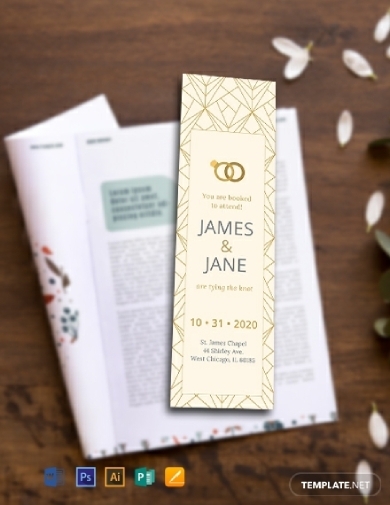 While the common wedding invitations include important information regarding the wedding, you can also present this information in a wedding bookmark by simply editing the text on this template. Only include the most vital details, such the names of the couple, the invitation statement, the date, time, and venue of the wedding ceremony, the venue of the reception if it is not the same as that of the ceremony, and the theme or motif of the wedding if there is any, so that the guests can prepare appropriate attire. 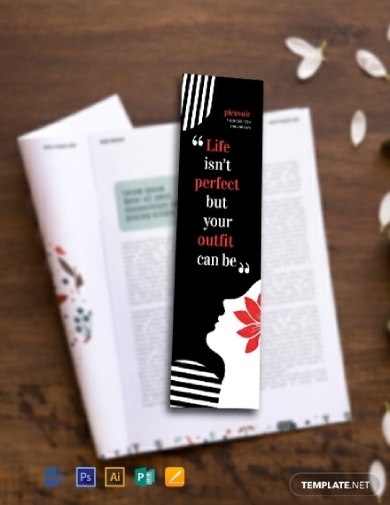 For those who are into the fashion industry, you cannot get stylish not just with the way you dress, your lifestyle, and accessories but also through your personal things, such as a bookmark. 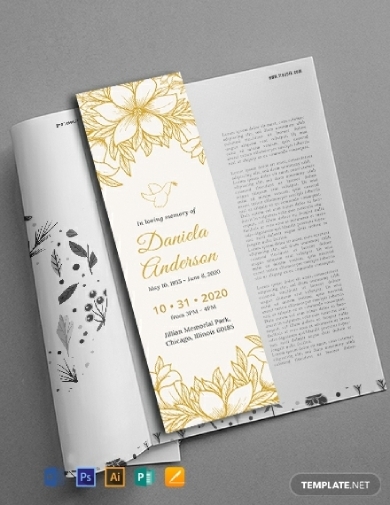 With the use of this fashion bookmark template, the design that you desire is just right at your fingertips. You only need to spare a few minutes in order to achieve your ultimate bookmark design. After, you can easily download the file and print them as you desire. It is not every day that we wake up feeling encouraged and driven to do the things we need to do for the day. There are times that we get so overwhelmed with life’s pressures and challenges that we tend to sit in one corner to contemplate on what we are going to do. During this time, all we need is a little inspiration and motivation. With the various sources of motivation, you need to know what works for you. 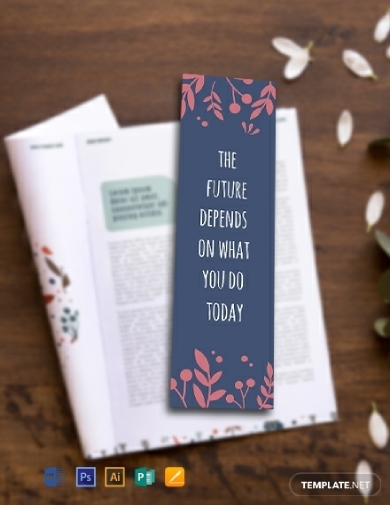 Commonly, people would get motivated through the statements they read, such as the one contained on this bookmark. Alternatively, you can edit the text and write your own motivational bookmark to keep you inspired and motivated. There are some things that are hard for us to let go, such as the memories we had with a departed loved one. We want to keep the good memories in our hearts while we live. In order to do so, we honor our loved one through keepsakes or memorabilia. There are a lot of memorial keepsakes that you can come up with, and one of those is a memorial bookmark. 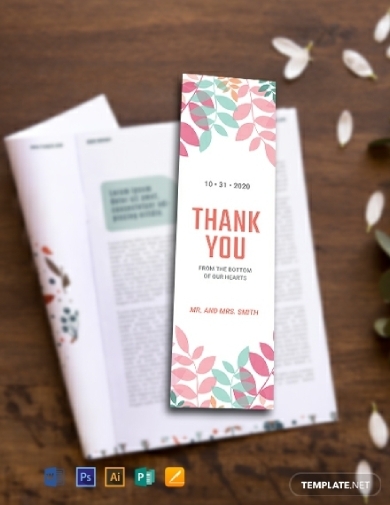 Through this bookmark, you do not only preserve your memory with someone but you also get to inform your family and friends as regards the funeral information, such as the date, time, and location of the funeral service. 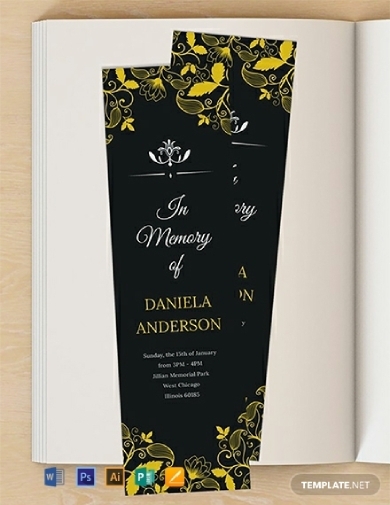 If you want to be unique in the way you inform relatives and friends regarding the funeral service, besides the typical funeral notices and funeral invitations, you can send them this funeral bookmark, which contains the important information regarding the funeral, including the name of the deceased, date of birth and death, and details of the funeral, such as time, date, and location. It comes in handy especially in this sorrowful time because it can easily be edited and personalized. 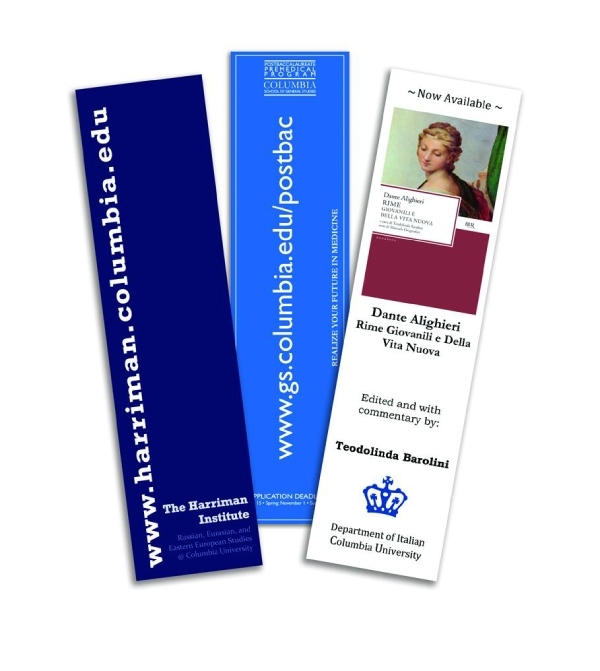 Because bookmarks are typically used in textbooks and novels, schools and universities provide their own university bookmark containing the branding for the school, such as the school name and logo, as well as the contact details, just like the bookmark example presented above. The colors used are also from the same color palette of the school logo, thus maximizing the school’s brand launching. As stated above, bookmarks come in different in different materials, and one of those materials that are typically used for a bookmark is the metal, similar to this metal bookmark example. Unlike those bookmarks that are inserted between pages, this bookmark can be clipped on a certain page of a book. It is designed to be as thin as possible so as not to damage the pages of the book.